Rihanna went on a rant over her ongoing feud with Ciara. 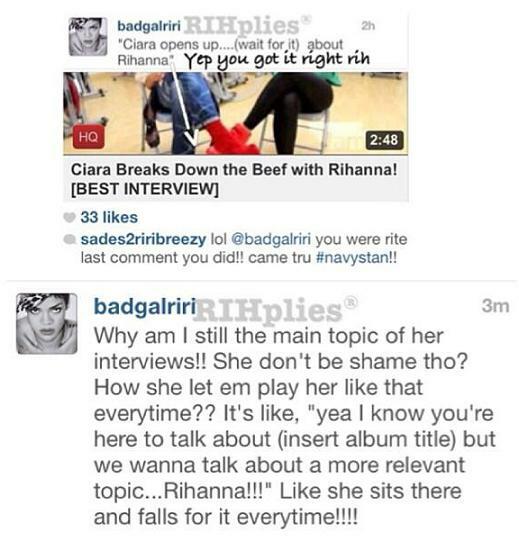 Apparently RiRi is upset that CiCi answers questions about her during interviews. Yes, Ciara could just say no comment but you’d think Rihanna would understand the fact that the interviewers keep asking about the alleged beef, just like they constantly asked about her and Chris Brown. Why am I still the main topic of her interviews!! She don’t be shame tho? How she let em play her like that everytime?? It’s like, ‘yea I know you’re here to talk about (insert album title) but we wanna talk about a more relevant topic…Rihanna!! !” Like she sits there and falls for it everytime!!!! If she’s really interested in stopping the back and forth with, Ciara should just shut down the questions about Rihanna.